Ft. Collins, Colorado, February 13, 2012 – Clink, clink! Thanks to New Belgium fans in 49 states who purchased custom beer globes and uploaded glassware-related Facebook photos, the “Glass that Gives” program raised $8,921 for four nonprofit organizations. 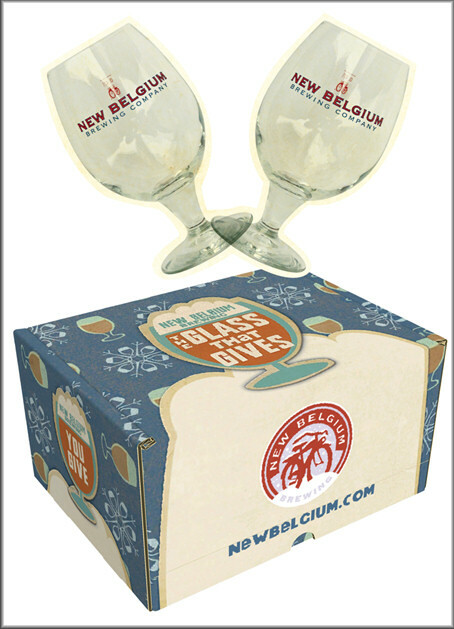 During the campaign, New Belgium Brewing, maker of Fat Tire Amber Ale, sold nucleated glassware in a winterized two-pack gift box for $8.99, with $1 from each purchase going to charity. Between November 1 and January 31, New Belgium sold 5,921 glass sets and shipped them to beer enthusiasts around the country. In addition, 3,000 people uploaded photos of themselves with the glassware, which raised an additional $750 per nonprofit ($1 per picture, equally divided among the groups). New Belgium is proud to award the following: Water Keeper Alliance - $2,735, Organic Farming Research Foundation - $2,158, People for Bikes - $2,039, and Save the Colorado - $1,989. • Water Keeper Alliance (www.waterkeeper.org), whose mission is to provide a way for communities to stand up for their right to clean water and for the wise and equitable use of water resources, both locally and globally. • Organic Farming Research Foundation (www.ofrf.org), whose mission is to foster the improvement and widespread adoption of organic farming systems. • People for Bikes (www.peopleforbikes.org), whose mission is to make bicycling safer, more convenient, and appealing to everyone. • Save the Colorado (www.savethecolorado.org), a philanthropic partnership that works to protect and restore the ecological health of the Colorado River by raising public awareness and by inspiring and supporting nonprofit environmental organizations. As an additional part of the campaign and a play on the new winter seasonal, “Snow Day,” New Belgium also sent glassware every time flurries flew at the brewery. New Belgium had 12 snow days, which means 286 people are now the proud owners of a New Belgium glass set. New Belgium Brewing Company, makers of Fat Tire Amber Ale and a host of Belgian-inspired beers, began operations in a tiny Fort Collins basement in 1991. Today, the third largest craft brewer in the U.S., New Belgium produces eight year-round beers; Fat Tire Amber Ale, Sunshine Wheat, Blue Paddle Pilsner, 1554 Black Ale, Abbey, Ranger IPA, Belgo IPA and Trippel, as well as a host of seasonal releases. In addition to producing world-class beers, New Belgium takes pride in being a responsible corporate role model with progressive programs such as employee ownership, open book management and a commitment to environmental stewardship. For more information, visit www.newbelgium.com. - New Belgium's Glass That Gives going strong.